Life changed ten years ago, when Apple rolled out the Mac OS X Public Beta. Of course, I didn’t know it at the time - on 13 September, 2000, if my memory serves me correctly, it seemed like this new OS was just the next step (albeit a big one) in the evolution of the Mac’s operating system. My life changed ten years ago, when Apple rolled out the Mac OS X Public Beta. Of course, I didn’t know it at the time - on 13 September, 2000, if my memory serves me correctly, it seemed like this new OS was just the next step (albeit a big one) in the evolution of the Mac’s operating system. Of course, as someone who loved to live on the bleeding edge of technology, clearly this was something I had to have. After overcoming the initial shock at seeing all the colors after the nearly-all-gray world of Mac OS 9, I realized that the bright and colorful look of the public beta was actually quite appealing, at least to my eye. While icons and windows simply existed in OS 9, they seemed to jump off the screen in OS X. Shadows helped distinguish between layers of windows, and the colorful dock at the bottom of the screen contained easy-to-access icons for both running applications and programs I placed there myself. Just on visuals alone, there was no doubt that the Mac OS X Public Beta represented a clean break from the past. That’s not to say all was perfect…Aqua, as Apple called its new interface, was besieged by an attack of the striped backgrounds. Everywhere you looked, there were stripes—in the menu bar, in menus themselves, in the Dock, in Finder windows’ title bars, in the background of Calculator. 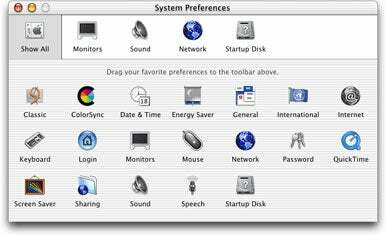 Aqua also consumed a lot of screen real estate, especially when compared to OS 9—Mac OS X’s windows were larger, its Dock took up more space, and Finder windows had huge toolbar areas filled with massive icons. And don’t even get me started on the heavily translucent menus—ugh. 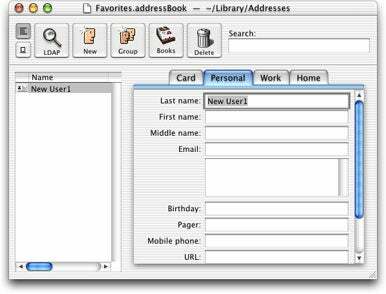 Finally, some apps—Address Book, I’m talking about you—were just downright ugly. Still, overall, I remember thinking that I was using something that felt modern and forward-looking—and that was before I even started to work with the new OS on a daily basis. Once I did, I was amazed for a second time—the new OS really worked…well, OK, it really worked in a number of important ways, and it really failed to work in a number of other ways. To me, the important ways in which it worked boiled down to one thing: stability. 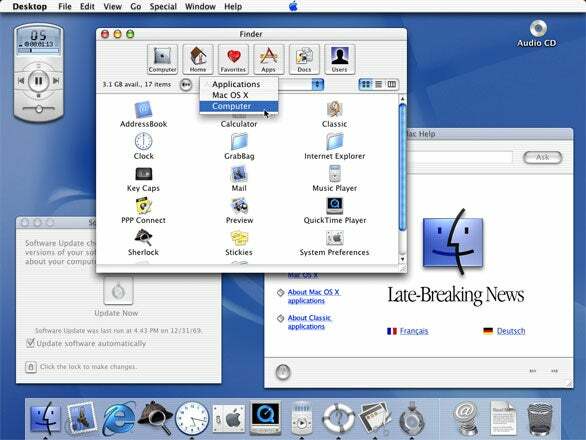 The Mac OS X Public Beta included all the proper buzzword technologies of the day—it had true multitasking support, protected memory, and other goodies under the hood to help keep the machine running, even when an application quit. So instead of rebooting because a program crashed, as I had to do in OS 9, the Mac OS X public beta would simply display a message telling me that a program had crashed, but that I could continue working. What a wonderful change! Of course, there were less boast-worthy changes with the public beta. For one thing, it was slow—Finder in particular was extremely slow. 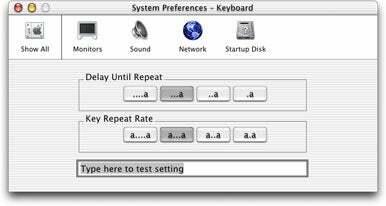 Simple tasks such as launching applications and opening files could be unbearably slow; in tests I ran at the time, launching programs was anywhere from two to five times faster in OS 9. Another problem was peripherals: most of them simply didn’t work in the public beta. 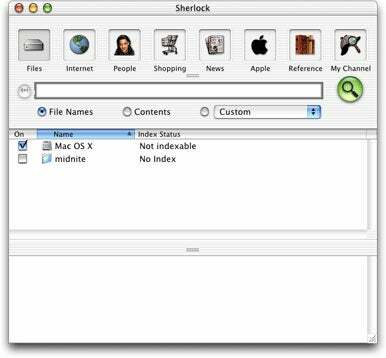 In the days before Spotlight, this is how OS X handled searches. I recall having a scanner, printer, and external CD drive, none of which worked at all in the public beta. Doing something as simple as printing required rebooting my Mac into OS 9. Still, for as often as I worked and as little as I printed, the added stability was worth the occasional pain and suffering to print. Even with the plethora of changes I’ve covered, the public beta probably wouldn’t have changed my life if it hadn’t been for one additional key fact: Mac OS X Public Beta was written on top of a Unix core, and included a Terminal application to directly access that core. Even more importantly, in the beginning, using Unix commands in Terminal was nearly a must for everything from getting certain printers to work to changing network settings without rebooting to making Terminal’s window translucent to installing a text-based alternative to the Internet Explorer browser to finding strings of text within text files. 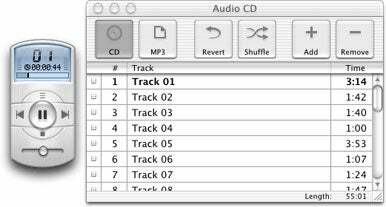 Remember when there was no OS X version of iTunes? Because most Mac OS users—myself included—had little to no Unix experience, this entire side of the public beta was a completely new experience for us. I found myself so frustrated that I quickly wore out my phone, calling a friend with strong Unix skills. Over time, I figured that taking advantage of the friendship on a hour-to-hour basis was a quick way to lose my friend, so I started keeping a simple text document containing the various tips he’d given me on the ways of Unix. Over time, the text document gave way to a FileMaker Pro database, and from there, for reasons I still don’t clearly understand today, I decided to put the database on the Web. Lacking any real creative talent or sense for marketing, I simply named the site for what I hoped it would be: macoxshints.com. The idea was to start a site where the community could be read and contribute tips concerning the brave new world that was Mac OS X. I’d love to say I had a grand plan to create the ultimate Mac OS X hints destination site on the Web, but it was nothing like that—I was just looking to learn more about what it took to create and run a Website. Apparently, the Public Beta lacked a slider control. In the beginning, of course, most of the contributions were mine—I wrote the majority of the hints the first year the site was online. Slowly, though, the momentum picked up, and users began contributing hints. Years passed, and my hobby continued to grow, and take more of my time. I eventually started writing some freelance article for Macworld, all while still fitting in a “real” job to pay the bills. As the freelance articles turned into a monthly column on OS X hints, someone at Macworld realized it might actually be more cost effective to employ me on a full-time basis. So in 2005, that’s just what happened—Macworld purchased the site, hired me to run it and write full time, and I quit my “real” job. Many of these System Preferences panes still exist, albeit with new names. While I’ve now moved on to my next challenge—working for a two-person Mac software development company—I have great memories of my time at Macworld, and as evidenced by this article, I’m still writing here on occasion. Looking back now, what amazes me most is that absolutely none of this would have happened without Apple’s decision to head in a new direction with Mac OS X. If that initial public beta had been nothing more than OS 9 with a pretty new face but the same basic underpinnings, I wouldn’t have had the chance to launch a Website, join the premier Apple-related magazine and Website, and wind up working with one of my favorite Mac application developers. So thank you, Mac OS X Public Beta, for spurring a change in my life that I couldn’t have predicted, but am very glad to have experienced. I’d like to say a public “thank you” to the Graphical User Interface Gallery Guidebook for allowing use of their Mac OS X Public Beta screenshots in this article.